Trump delivers speech in the House of Representatives. 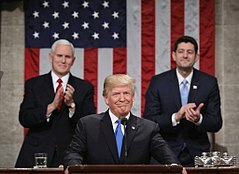 On Tuesday night, February 5th, President Donald Trump delivered his speech in the House of Representatives, after being forced to postpone his annual speech, originally scheduled for Jan. 29 due to the shut down. Trump began his speech by touting the strength of the U.S. economy, saying that it was growing at a record rate, and claimed progress with foreign adversaries and allies alike, according to USA Today. He also pointed out, in his speech, that he wants immigrants to come to the country “in the largest numbers ever” so long as they do so legally. “Tonight, I’m asking you to defend our very dangerous southern border out of love and devotion to our fellow citizens and to our country. No issue better illustrates the divide between America’s working class and America’s political class than illegal immigration. Wealthy politicians and donors push for open borders while living their lives behind walls and gates and guards,” said President, Donald Trump. President Donald Trump and first lady Melania Trump have invited several special guests that ‘each had an incredible story to tell’ and ‘represented the very best of America.’ Among these guests include a 6th grade student from Wilmington, Delaware, Joshua Trump, who has been bullied in school due to his last name. “When the teacher is like, ‘Joshua Trump, are you here?’ I’ll go, ‘Yes,’ and almost everybody will laugh, besides my friends,” said Joshua to Inside Edition in an interview, before his invitation was announced.